Remember, you were not aware that you were making a decision at the time; but when you look back it is usually obvious what decisions you made based on what you now believe and what you now do. Some people decided they were bad or inadequate. Others decided they should not take risks for fear of humiliation if their efforts fell short of perfection. Many decided to become approval junkies and try to please adults at great cost to their self-esteem. Some are obsessed with the need to prove their worth. And some decided they would be sneaky about their mistakes and do everything they could to avoid getting caught. When parents and teachers give children negative messages about mistakes, they usually mean well. They are trying to motivate children to do better for their own good. They haven’t taken time to think about the long-term results of their methods and how the decisions children make stay with them for the rest of their lives. So much parenting and teaching is based on fear. Adults fear they aren’t doing a good job if they don’t make children do better. Too many are more concerned about what the neighbors will think than about what their children are learning. Others are afraid that children will never learn to do better if they don’t instill them with fear and humiliation. Most are afraid because they don’t know what else to do—and fear that if they don’t inflict blame, shame and pain, they will be acting permissively. There is another way. It is not permissive, and it truly motivates children to do better without paying the price of a lowered sense of self-worth. Teach children to be excited about mistakes as opportunities to learn. Wouldn’t it be wonderful to hear an adult say to a child, “You made a mistake. That is fantastic. What can we learn from it?” And I do mean “we.” Many mistakes are made because we haven’t taken time for training and encouragement. We often provoke rebellion instead of inspiring improvement. Children need daily exposure to the value of mistakes—and learning from them in a safe environment. 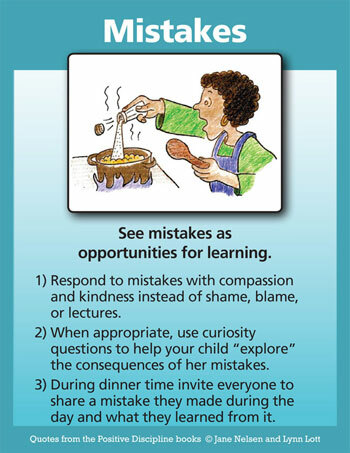 Many families have found it helpful to invite everyone to share a mistake of the day and what they learned from it during dinnertime. Children can truly learn the courage to be imperfect when they can laugh and learn from mistakes. What a fresh perspective. I love it!